​Fred has lived in Sitka for most of his life except 4 years in Ketchikan where he taught at Ketchikan High School and is also a graduate of Sitka High School and Arizona State University. He is married to Debbie and they have 3 children Keith, Gordon and Holly. 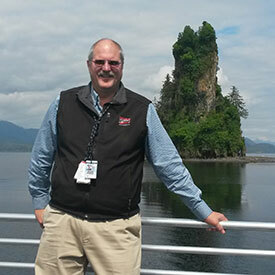 Fred has owned his own business in Sitka and currently is the port manager for Cruise Line Agencies of Alaska which is an Alaskan company based in Ketchikan. Fred has worked for CLAA for over 20 years. Fred has been active in the community and State of Alaska serving on the Sitka School Board for 7 years, 6 years as President. Fred also has served as Mayor of Sitka, has been on the Alaska School Board Association Board of Directors, ASAA Board of Directors and also on the Board for the Alaska Travel Industry Association.